Body worlds | Helping the best to get better! ← Methodology of Training 2.0 – Component 2: Time and timing. Once and awhile you look at your body you touch it or feel it, but we are seldom amazed by the functioning of this extremely complex and beautifully designed “machine”. For sure, it is hard to imagine how it looks and what is going on inside this machine. This week I visited Body Worlds in Amsterdam, the fantastic exhibition of the human body by Gunther Von Hagens, a German anatomist who developed a new way to preserve by plastination of the body. One body takes around 1500 hours of work to get to the form in which they are displayed in this exposition. 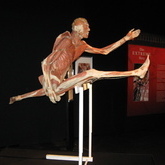 Not only are the bodies, sometimes partially opened, displayed in natural positions (especially quite a few athletes), also isolated organs and their pathologies (like an enlarged liver or an infarcted myocardium) and physiological systems, like the CNS or the vascular system, are displayed in a beautiful way. Excellent video’s enhance the dynamics of the exhibition. 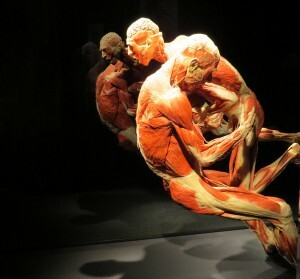 The exposition is great to visit if you are interested in the anatomy and physiology of the human body. At lot of people are surprised about the size, the shape or the position of organs in the human body. If there is a Body World exposition nearby, go there, if not, at least watch the YouTube video about Gunther Von Hagens, presenting a live-dissection (in English, with a great German accent).